Cheap car rental from www.carhiremarket.com is offering such great deals at the moment that it’s a splendid time to head off for the wonderful Rhineland and explore some of the most majestic scenery in the world under your own steam. This is one of the most romantic regions in the whole of Germany and you can easily see why. It’s unrivaled for its rolling hills and valleys, vineyards and above all its almost impossibly beautiful castles – straight out of a fairytale. The valleys of the Mosel and Rhine are especially enchanting, and with such good, modern roads and numerous inns along the way this has all the makings of a fabulous break. The two regions of Rhineland-Palatinate and Saarland which have a border with France in the west did not actually exist in their modern form until after the Second World War. 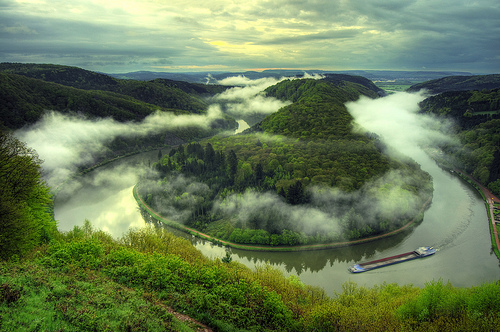 The Saarland was ruled by the French until 1956 and now it effectively forms a land bridge between Germany and France. In common with the rest of Germany, the Rhineland has seen a fair bit of turbulent history. But as Orson Welles implied when he pointed out that Switzerland has produced only the cuckoo clock, this is not a bad thing for future generations who reap the benefits of turmoil, in the form of picturesque castles and fortified towns in this case. One man’s misfortune is another man’s fine art, and some of the castles in the Rhine and Mosel valleys have to be seen to be believed. Basic defense might have been their original function but beauty on a breathtaking scale has been the result, and castles like Burg Eltz in the Mosel Valley can bring tears to the eyes of a diehard romantic. This is Wagner land, of course, or at least it’s where he derived much of his mythological superstructure for the Ring Cycle. The Rhine Maidens are an obvious example, still no doubt guarding their treasure, but most of the legend of the Niebelungs is set in the ancient city of Worms on the same river. Worms was also the seat of the mythical Burgundian King Gunther as well as the site of some of the Reformation’s bloodiest episodes. For medieval Gothic architecture on a monumental scale, stop off at Worms, Speyer and Mainz cathedrals for a fantasy of soaring spires, flying buttresses and some of the most malevolently impressive gargoyles in Europe. The whole region is popular with enthusiasts of white wine. The Deutsche Weinstrasse or German Wine Route is famous for its breathtaking landscape of historic buildings and cities, and visitors enjoy stopping off at quaint inns and imposing castles as they effectively pub crawl along one of the country’s oldest tourist routes. Park the car at the Deutsches Eck in Koblenz, where the Mosel joins with the Rhine, and take a boat trip upriver. It’s the best way to experience this amazing, rock-lined valley and appreciate the part it has played in Germany’s eventful history. Germany, with its unparalleled scenery and excellent autobahns, seems custom made for a motoring holiday, and the Rhine Valley is just the ticket for this. John has enjoyed traveling since he was a young boy when his parents first took him to visit family overseas. Since leaving home, John has tracked down family all over the world and regularly jets off to faraway lands to see distant relatives.